First Environment—the third party organization that validated the Greensburg Wind Farm for NativeEnergy and is currently validating our Laurelbrook Farm Compost Project—has just been named “Best Verification Company in Voluntary Carbon Markets” by Environmental Finance. The magazine asked companies for nominations via an online form, and over 500 responses were received. First Environment was selected for its “…innovation; quality of service provided and influence on the market.” Knowing the high quality of the work they do, we’re not surprised. When we consider a new carbon reduction project, our supply team conducts an extensive background check. We calculate the emissions that will be reduced, evaluate financial additionality, and establish a relationship with the project via site visits and meetings with project participants. If the project meets NativeEnergy’s requirements, the supply team or the project developer drafts a project design document (PDD), which describes the project details and the carbon reduction calculation. All of our projects must meet one of the nationally recognized carbon standards, like Verified Carbon Standard (VCS) or Climate Action Reserve (CAR). After the supply team completes the PDD, it’s time for some third-party eyes. Several of the leading carbon standards require accredited organizations to review and “validate” projects. 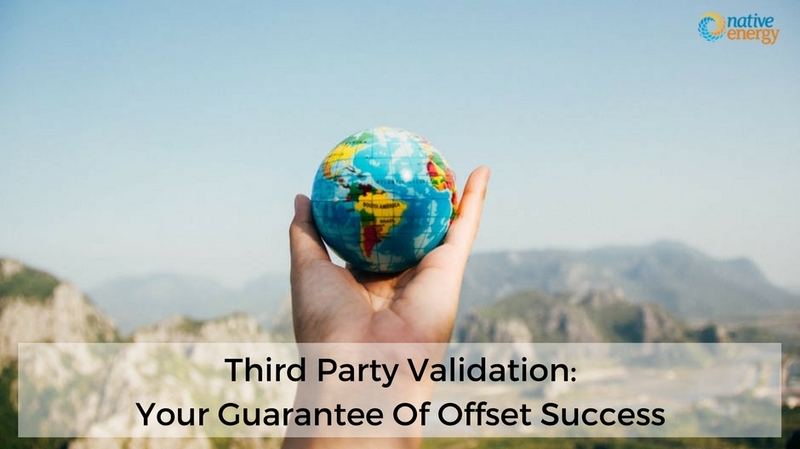 Validation is an assessment of the project design to make sure it both meets the requirements of the standard and correctly calculates and monitors future greenhouse gas reductions through accepted methods. NativeEnergy sends the PDD to a selected validator of its choice, who then examines the project details. In the case of Greensburg and Laurelbrook, we selected First Environment as the validator to review the projects’ PDDs under VCS. Once the project has been formally approved by the validator in accordance with the standard, it is publicly listed on a carbon registry website. Once a project is operating, the carbon reductions that it generates are “verified.” This time, an accredited third party reviews actual project operation data—energy production, gas flows, and so on—to determine the number of tons that were reduced and, as a result, are issued by the standard as offsets. Because verification can add significantly to the cost of small projects, NativeEnergy tends to verify performance after their first year of operation (to make sure the project is performing as planned) and then again several years later (to confirm that any estimated offsets that have been sold are supported by proven reductions). The end result? You know that your carbon offsets are real and permanent.